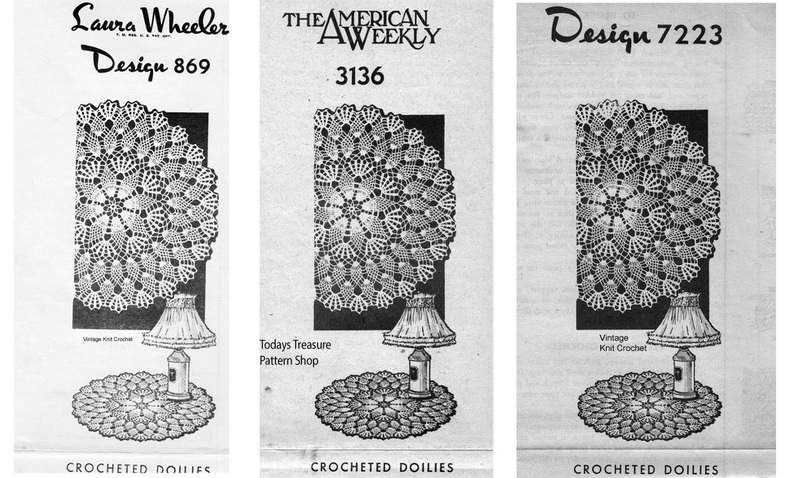 Some of the Mail Order Design patterns were more popular than others. But how can you tell which ones were the 'most popular'? That one is easy .... by how many times it was duplicated. Lets take this marvelous Mail Order Pineapple Doily as an example. 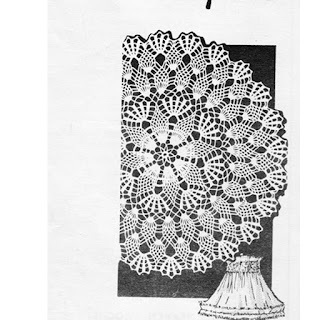 The doily, depending upon materials used, can be made in six different sizes ranging from a small of 11 all the way to 25 inches in diameter. Design 869 (Laura Wheeler) was released in April of 1951. "Crocheting this doily is time well spent. Stunning in two colors; start the second color on the second pineapple round". It was ran again in 1954. Design 7223 (Alice Brooks) was published in 1957. "Crochet with an heirloom future - as centerpiece, placemat set - prize winning doilies. Lovely in two colors, starting second color in second pineapple round". It was ran again in 1959. And it was released in a separate syndicate column as American Weekly 3136. (I don't know the dates or description), but would assume it was in the same time span ... or, based on the paper quality, no later than 1961. I'm just beginning to understand that American Weekly was apparently associated with Readers Mail. And that's how the it went for the popular designs. They are released, and if sales are more than typical, they are the sister name -- Laura Wheeler or Alice Brooks and even more sales were made. 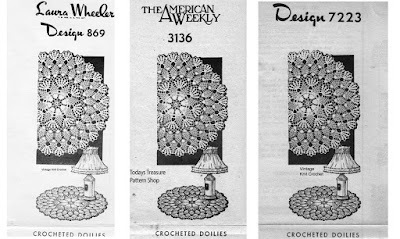 I'd wonder how frequently the fiber artists buying these patterns discovered they bought the same Design twice ! Okay, I'll get back to work now. Thanks for dropping by. I've said this a variety of times ... the Mail Order Design patterns have a tendency to build on each other. You know, variations on a theme. I imagine this allowed them (Household Arts and Readers Mail) to publish the HUGE number of Designs in their weekly advertisements. Here's another example of just that in a most delightful fern motif. Alice Brooks, Mail Order Design 7044, was published on November 6, 1957. "The fern design - a favorite at many fairs. One of these doilies make a choice gift. For a more lavish gift, think a buffet set of three, or luncheon set". Alice Brooks, Mail Order Design 7209, was published on March 31, 1959. "Add a fresh touch of Spring with this fern design set - its beautifully shaped to enhance a chair or buffet". The process is easy to envision. The 'designer' needs to produce X number of patterns for the next month and a logical starting points is an 'already popular' Design. Just half the pattern with a couple edge adjustments and Ta-Da -- it's a chair set. Now, not just a variation of a design, but a matched pattern set. I'm sure as I continue to work through the Mail Order Collection, I'll come across many more examples of the 'matched set'. Now, if you came in looking for Fern motif recommendations, there are an assortment in the shop.